Week 9 Recap: Davis Cup! On Saturday, July 29, our students competed in Davis Cup, as is KCTL midseason tradition. Modeled off the real Davis Cup, each of the five sites represented a country in the doubles tournament. We put the following nations on the map: Mongolia (Tompkins), Greece (Marcy), Brazil (Lafayette Gardens), Kenya (Sumner), and Trinidad & Tobago (Jackie Robinson). Saturday was an usually windy day at Marcy Playground, but we held things (the portable tennis nets) down (literally) with bags of rice. Before the matches began, student ambassadors from each site presented some historical and cultural information on their country to an audience that included many volunteers, parents, family members, and other spectators. The national anthems from each country were played. The format of the tournament was as follows: The first doubles team to 10 points was the winner of the match. To compliment real tennis scoring, victory meant winning by at least two points. Every single point counted toward the final team score, which propelled participants to make the most of every single point. The final point count was divided by how many matches each site played to determine the Champion. During play, we witnessed some healthy competition from each site which helped to create a fantastic atmosphere. Program Manager Dave Webley notes that he observed "very encouraging signs that our students are improving their games, while learning how to deal with their emotions when competing." Mongolia was declared the Champion at the end of the day. Congratulations, Tompkins! Although four teams did not go home as winners, all participants had a thrilling and rewarding Davis Cup tournament. Everyone played at least three matches, remained engaged, and demonstrated competitive spirit. July's educational theme, Cognitive Awareness, concluded with an activity that, for many students, required an entirely new way of thinking: playing tennis with a teammate. While the first eight weeks of the season emphasized individual athletic performance and behavior, July 30 highlighted the importance of collaboration with a tennis partner and appreciation for an entire team. The Davis Cup is an annual tournament in which each KCTL site represents a country. Landmarks on our diverse world map included Guyana (Lafayette Gardens), France (Marcy), Trinidad & Tobago (Jackie Robinson), Brazil (Sumner), and Senegal (Tompkins). Before play, the students and volunteers from each team briefly discussed key facts about their countries. Tournament play itself consisted of nine "Champion of the Court" stations, in which participants were paired up and matched up according to skill level. In order to become the new Champion, the Challengers had to score two consecutive points against their opponents. All points won on the Champion side contributed to each team's total score. The final results of the tournament were definitely shocking, considering that Marcy is our long-term defending champion. Lafayette Gardens, Tompkins, and Sumner, placed in first, second, and third, respectively. We are extremely proud of all players and teams for their efforts! 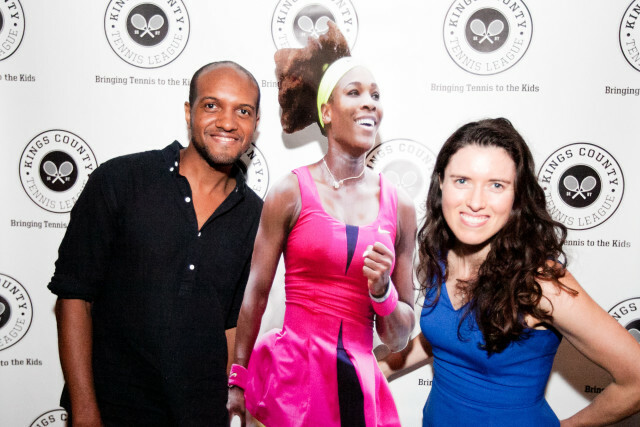 Beyond tennis, we were fortunate to have two special guests on the court with us. Thank you to KIND Snacks for again sharing healthy goodness with us, and to Birdie NYC (GreenNYC's mascot) for awesome reusable water bottles in exchange for our promise to use less plastic! Saturday, February 6 marked a special day in Kings County Tennis League's off-season. 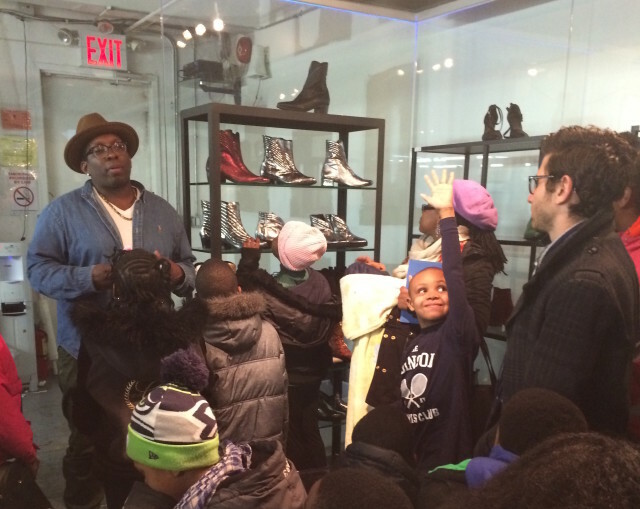 Our youth athletes enjoyed a unique educational experience--off the tennis court--at a footwear factory in the Garment District of Midtown, Manhattan. 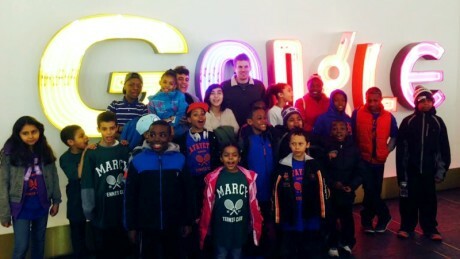 The field trip was the latest installment in our series of efforts to inspire our youngsters through non-tennis enrichment. The event comes as a follow-up to our 2015 Google visit, which exposed the students to a new possibility, a career in the Technology sector with the world's biggest employer. Both field trips function as "real life" applications of our Off-Court Curriculum, which aims to help our students develop life skills outside of tennis. 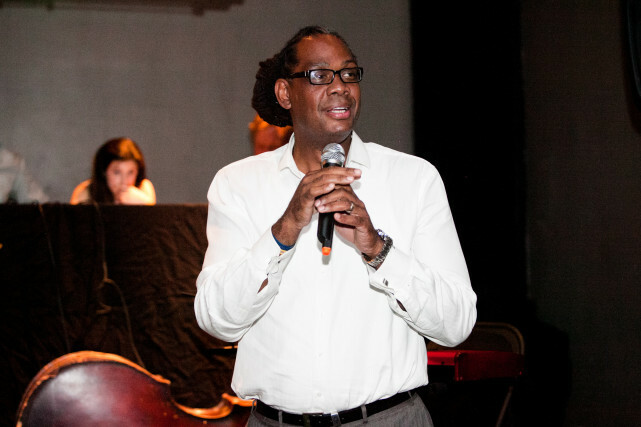 Our host, Marcy Tennis Club Volunteer Omar Bailey, graciously welcomed 30 students and 15 parents to the factory, his workplace. He's the co-founding partner of Modern Vice, a luxury shoe brand that is designed, developed, and manufactured right here in our city. Omar's factory is one of the last remaining sites of its kind in Manhattan. As young as age nine, Omar dreamed of working in the footwear design industry. After gigs with big name brands like Nike, though, Omar was ready to take his career to the next level as an entrepreneur. Omar has created masterpieces for celebrities including Shaquille O'Neill, Terry Crews, Lady Gaga, and QuestLove. The experience strongly inspired the students, especially the few who said they're aspiring footwear designers. Professional dreams aside, the machinery, the manufacturing process, the creative work, and, of course, the finished products kept all of the students fully engaged. At the end of the tour and presentation from Omar, we challenged students with the question "What's your shoe story?" We asked the students to draw, explain, and name their own shoe. Shoe design and manufacturing might have little to do with tennis, but we like that entrepreneurship--an individual, risky endeavor that requires belief in oneself--can be connected to our favorite individual sport. "You don't always have to go for the obvious," Omar told his listeners on Saturday. "If there is something you want to do, be confident and believe you do it." Visit us on Facebook for more photos from the field trip. 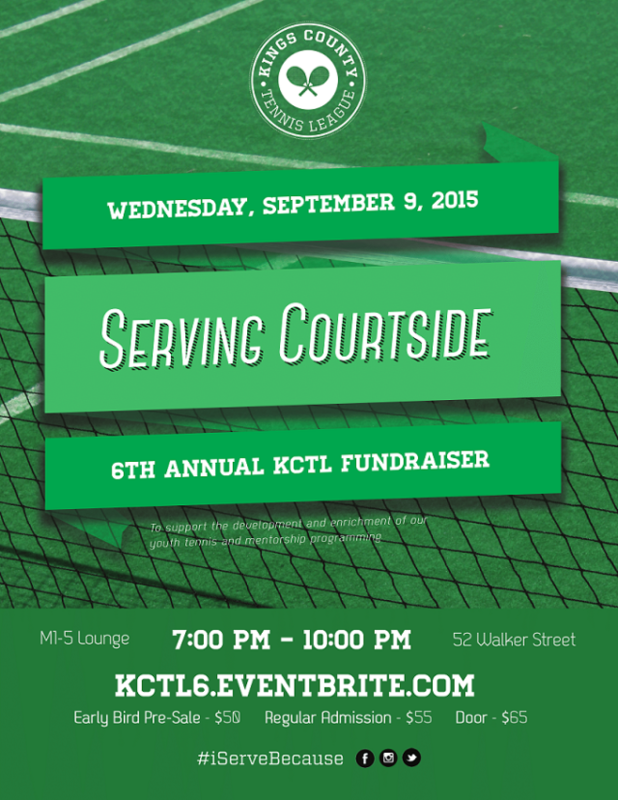 It's almost time to rally at all five KCTL sites! We'd like to extend an especially warm welcome to the new kids on the court, Jackie Robinson Tennis Club. 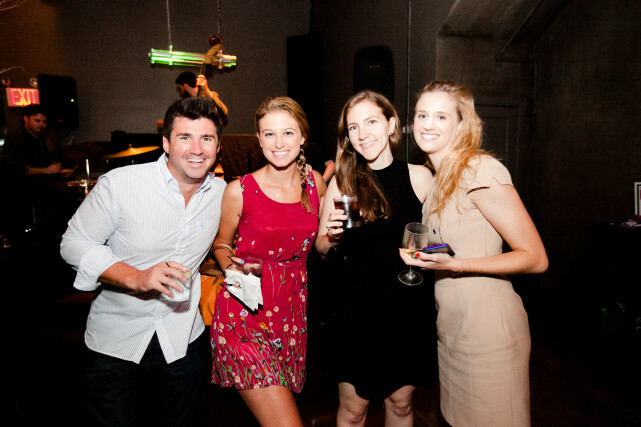 As for everyone else--Marcy, Tompkins, Lafayette Gardens and Sumner--we're excited to have you back! Our season begins this Saturday, May 30 at 1:00 PM; volunteers are expected to arrive by 12:00 PM. We look forward to seeing everyone then. Parents, if you haven't yet registered your child, you can still sign up here to guarantee his or her spot. KCTL Kicks Off New Mentoring Initiative at Google! 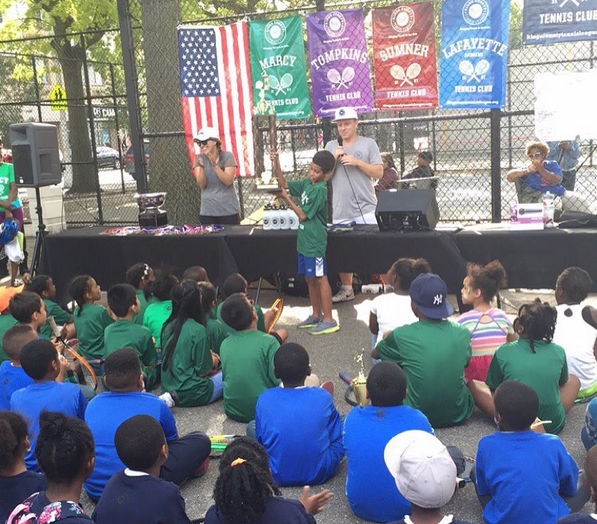 We recently announced that we’re supplementing our four-month tennis mentoring program with off-season field trips. As the weather only allows for so much outdoor tennis time, periodic educational outings will enable us to fill in the gaps while widening our students’ world views. So, on Monday, April 6, we made our first stop: Google’s office in Manhattan! Accompanied by their parents and a few volunteers, about two dozen KCTL kids explored the New York City office of the world’s most admirable employer. We’re very grateful to Sumner Site Leader Bryce Richards – a Software Engineer at Google when he’s not teaching tennis – for arranging the special visit. The students begin their tour by examining antique computers – which provided a glimpse into how much technology has evolved since before their lifetimes. Next, it was off to Google’s game room, which included video games, pool, ping pong and treadmills. We were impressed to see the skills they have beyond the sport of tennis! The games continued in the LEGO café, followed by the climbing wall. But we didn’t forget that Google is an office: an environment where employees congregate and accomplish projects together every day. 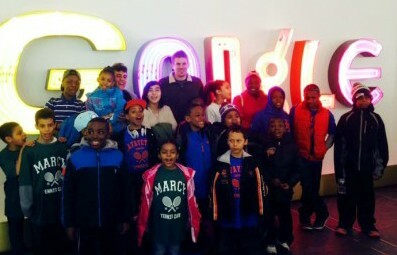 The students observed Google’s uniquely designed conference rooms and workspaces, too. This final component of the trip gave them critical insight into look and feel of an exceptional, forward-thinking professional space – somewhere they might one day strive to build a career. Thanks to everyone who made this an incredible experience for our students. 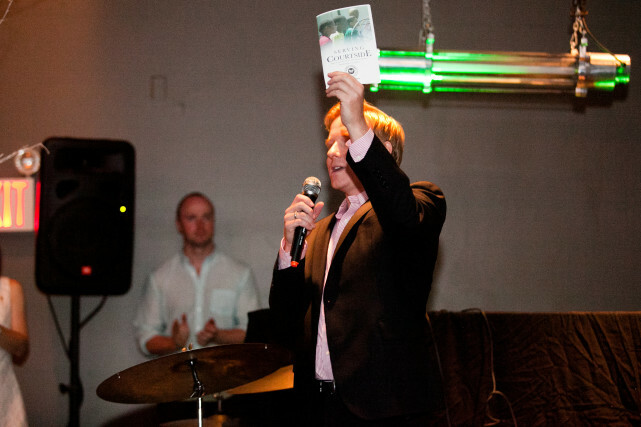 Be sure to check out additional photos on Facebook.